Ever need to make more than 1 card? Ever wonder how many sheets of cardstock you will need? Well this calculator should help with that. Wonder about how much of a border to show on each layer? Well hopefully this will provide some visual help. I mainly use Stampin' Up! products. So, here is a chart containing the HEX (Web) color codes for their color families. What color to use? Search for color combinations using colors you select. There is also a random button which will produce a random color combo. 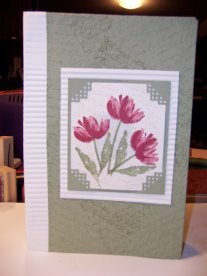 Not only do they have combinations for Stampin' Up!, but CTMH and Copic. They also have a tool which helps you cross-match colors between various companies.